I made this recipe last night for dinner. It was rather tasty and pretty simple. It cooked in the slow cooker on high for 4 hours. Chicken falling off the bone goodness. I used 2 breasts and 4 thighs. Joel likes the dark meat and I like the white meat. I served with brown rice and brussel sprouts, and freshly made cranberry sauce. We sat down to dinner and then I sadly forgot to photograph the end results! (You’ll just have to imagine and go by my pre photos.) Sorry. If you own a slow cooker you may want to consider this as it is fairly healthy alternative to heavier fare but still a delicious treat on a winter’s night. *also I am obsessed with the spice Za ‘atar since discovering it. You can easily substitute oregano and then just increase your salt. Pat chicken dry, making sure it’s dry is very important. Just roll up in some paper towels and let it sit for a few minutes while you prepare other ingredients. 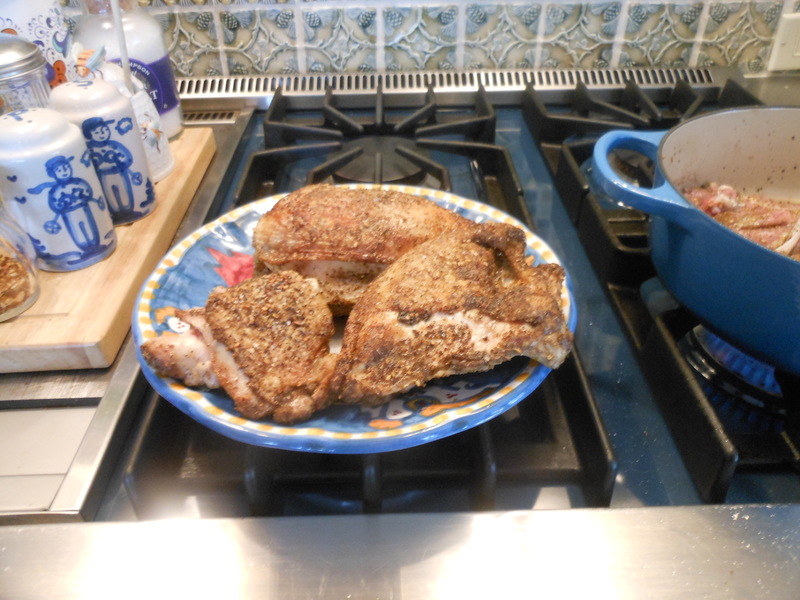 In a small bowl, I mixed dry spices together and rubbed all over the chicken ,making sure to cover well. I browned chicken in hot oil and butter for about 3- 5 minutes per side, just crisp it up to seal in flavor. Place chicken in slow cooker. (I always spray my slow cooker with Pam for easy clean up.) Use a pair of tongs to move chicken around because a fork can and will pierce the skin and let out all the good juices. In that same skillet on stove, mix in the broth, lemon juice, garlic and white wine and bring to a boil, deglazing the pan as you go (scraping up all little brown bits). Let it boil for a few minutes, then pour over the chicken in the slow cooker. Cover and cook on high for 3 – 4 hours, I cooked for the full 4 hours. I was home so I turned the chicken once; this is not necessary but I couldn’t resist playing with it. If it looks like broth is evaporating, you can add some more (I didn’t have to). I served over plain brown rice, and chicken literally was falling off the bone. I did de-fat gravy, but honestly there was very little fat. If you would like a thicker gravy remove chicken at the end, add 1 tablespoon of corn starch mixed with a little water and thicken it up, add more corn starch if you’d like. I didn’t, because it was delicious as it was. Nice and light. I did de-fat the gravy using a gravy de-fatter (great little gadget), I also strained excess garlic and anything else that may have fallen into the gravy. 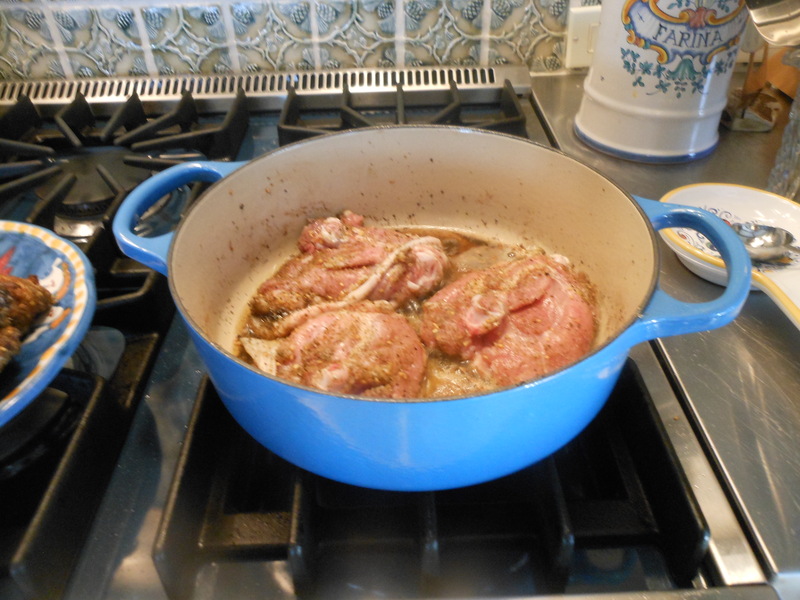 It’s not necessary and you can use a slotted spoon to take out chicken, and a ladle to add gravy. This entry was posted in chicken and tagged Lemon Chicken in the Slow Cooker, Slow Cooker Lemon Chicken. Bookmark the permalink. great Susan, keep me posted on how it comes out!!! 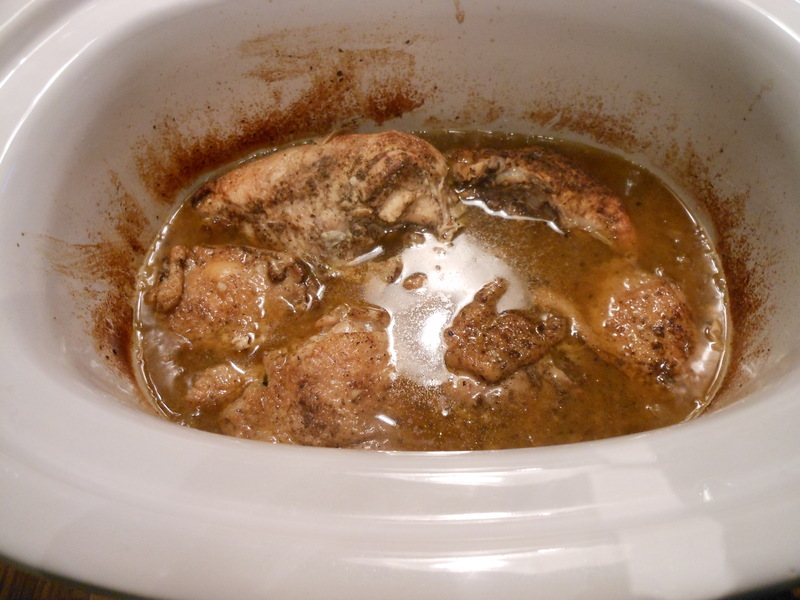 Inspired by you to get a slow cooker…just made and ate the chicken….Delicious!! Tomorrow minestrone soup, and then the skirt steak…. Great , u have to make that skirt steak. It’s so awesome! Happy u r enjoying and thanks for commenting , it means a lot to me.